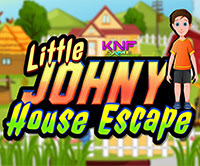 KnfGame - Knf Little Johny: House Escape is another point and click room escape game developed by Knf Game. Assume that there is a little boy named Johny, who is very playful and always gets into some trouble. Like that, one day Johny came earlier from school and started playing in his farm house. While he was hiding inside the motor room, his parents locked all the doors and went out without knowing that he is inside. Now Johnny can’t stay inside the motor room for long time, so help him to escape from the motor room by finding the necessary objects and solving the puzzles. Good luck and have fun! Stuck - I have 2 lanterns and 2 eggs - nowhere to put them, a paper clue with a red path arrow which bears no relation to any puzzles on the scene. I have found a number puzzle but no clue, a symbols puzzle on the bench, but no clue, a 9 symbol square on the LH barn but no clue, doors with no keys, a cockerel that crows to no avail, a red button puzzle missing a red button but no buttons to be found. I obviously need a SD for the fence but none to be found. Big red X from me. slider on side of tractor. Just move buttons to markers. This was a strange game. As soon as you get the key to barn you can get out. No need to finish rest of puzzles.